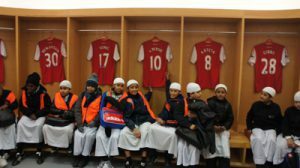 The year 7s of London Islamic School (LIS) were given the honour of representing the Tower Hamlets Muslim community in an interfaith event at the Emirate Stadium, home to the famous Arsenal Football Club. 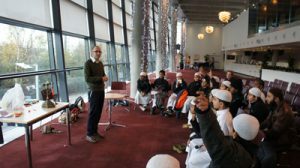 The event welcomed 1 school from each of the world’s major faiths which included a Sikh school, Hindu school, Christian school and Jewish school from various boroughs around London with LIS as the representatives for the Muslim community of Tower Hamlets. The event was organized by ‘Arsenal in the community – Arsenal for everyone project. Following this the schools were split into two groups, one to experience a tour of the stadium while the other group engaged in an interfaith workshop. LIS were spoilt with a tour around the stadium first which commenced with a visit to the Directors’ box and stand; they were seated onto the leather maroon seats and informed by the tour coordinator about the details with regards to the building of the Emirates stadium and the thought that went into it. From life as a Director they moved to life as an Arsenal player with a visit to the players changing room where they sat on the changing seats of the big Arsenal names. They then got the true feeling of a football star as they walked out the tunnel onto pitch side to receive a team talk from an Arsenal coach about some of the things that take place in the area followed by a question and answer session. Lastly the tour finished with experiencing the buzz of being a Manager after a tense game with a visit to the press conference room where they experienced the pressures a Manager or captain face while under the spotlight. In the afternoon session, the students were split into small groups to move along a circuit of workshops conducted by each of the different faith leaders present where they were given the opportunity to understand the basis of other religions and find similarities with their own as a means of promoting tolerance and harmony. Moreover they were able to ask questions to the faith leaders which they may have never had the opportunity of asking. The Headteacher of London Islamic School (LIS), Abdulhadi Mamon was extremely happy with the outcomes of the visit and said ‘This project is a very unique initiative that has used the concept of the football game which is very appealing to the youth, as a means to educate these young people on the importance of respecting each others cultures, beliefs and faiths within a community. This knowledge forms one of the key aims and objectives at London Islamic School (LIS)’. London Islamic School, teaches the national curriculum and Islamic curriculum and always looks for varied methods in teaching students to be upright, god conscious, sincere Muslim students who are prepared to make a positive contribution to Britain. The Arsenal for everyone project is one which was identified by the school as a unique way of educating students to respect people of all faiths, cultures and beliefs.